When you consider the guiding principles that govern your nonprofit, strengthening democracy may not leap to mind. However, whether intentionally or indirectly, nonprofits promote civic engagement and contribute to a healthy democracy. Think how volunteers come together at board and committee meetings to address community concerns - and how so many nonprofits exist to help others have a voice. Another way that nonprofits contribute to the strength of our democracy is by raising awareness about citizens’ right to vote. This month we are pleased to share a post from Nonprofit VOTE that explains how easy (and important!) 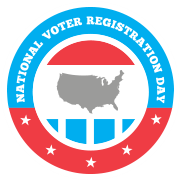 it is for nonprofits to play a role in National Voter Registration Day (September 25, 2018), such as by becoming a National Voter Registration Day partner. We are also pleased to share explanations and suggestions for two challenging situations: Have you noticed the new address bar messages in Chrome alerting visitors that a website is not secure? If so, our blog post explains what’s going on – and what you can do to increase confidence in your nonprofit’s website. And because fundraising is rarely limited to asking for contributions from residents of a single state, we’ve asked experts on the topic of charitable solicitation registration to shed light on the confusing and wildly different state laws that impact fundraising activities today. Thanks for including Nonprofit Knowledge Matters in your end-of-summer reading! If you know someone else who would appreciate the information shared in our monthly e-newsletter, you can easily forward this e-newsletter. Elections are not a time to sit on the sidelines, but to get in the game! Nonprofits can be key players in helping everyone have a voice in their own future, provided we operate on a strictly nonpartisan basis; Meaning simply, charitable nonprofits may “not participate in … any political campaign on behalf of (or in opposition to) any candidate for public office.” What simple steps can your nonprofit take to help ensure that our democracy works? How about helping people register to vote? Nonprofit VOTE provides guidance on how nonprofits can help make sure that every citizen’s voice is heard in each election. Many state associations of nonprofits have been promoting nonpartisan voter registration and education activities. We encourage your nonprofit to sign up as an official partner of National Voter Registration Day on September 25 and host a nonpartisan voter registration drive. Read how important - and simple - it can be for your nonprofit to make an important contribution to strengthening our democracy, in this guest post from Nonprofit VOTE. How secure does a nonprofit’s website need to be? The bar has just been raised for your nonprofit to maintain the trust of donors, volunteers, and clients - even if your nonprofit doesn't accept donations through its website. As everyone knows, data security continues to be all over the news, and no nonprofit wants to be featured in a news story because its donors’ or clients’ information was compromised. The newest version of Google’s Chrome web browser flags any website that isn’t using the HTTPS standard. In our blog post, “New website security warnings raise the bar for nonprofits,” we discuss what this means for nonprofits, how this change could affect fundraising, and what to do to protect your nonprofit and its data. If your nonprofit asks for donations, then it is “soliciting” contributions. Whether the solicitation is in person or in writing, whether on a piece of paper, or in an email, or even through a giving day or crowdfunding campaign, such activities are regulated – and regulated differently – state-by-state. One of the most challenging questions about fundraising is whether your nonprofit is required to register in any particular state simply because it has a “donate here” button on its website. Unfortunately, there is no easy answer. The number of states where your nonprofit has to register will depend on a legal analysis of not only the specific types of fundraising activities the nonprofit uses, but also the specific (and potentially very different) regulations, including exemptions, in each state. Because the analysis is so fact-specific and driven by state laws, we’re pleased to share this post by attorneys from the law firm Venable LLP who offer their expertise in this article: "Does my nonprofit really have to register before asking for money? What you need to know about fundraising regulations."